Review: Sherlock Holmes has been reborn again in Peter Abrahams’ Down the Rabbit Hole as the freshly thirteen year old Ingrid Levin-Hill solves a thrilling mystery. It turns out that Echo Falls wasn’t an ordinary town, but one filled with secrets, particularly a significant one. Being as the first children’s book ever written by Peter Abrahams, I would have to say he has caught the sense of a relatively detailed story easy enough for kids to comprehend. Ingrid Levin-Hill is a likable ordinary girl who didn’t expect herself to be caught up in a mystery, let alone a one filled with twists and turns. An exciting tale of a murder mystery being solved by your typical teenage sleuth will keep you on the edge of your seats as you anticipate what will happen next. You wouldn’t be able to put down this book until you’ve finally solved the mystery, or rather when Ingrid does. Down the Rabbit Hole is indeed an adventure you would be willing to take. Subject of many reviews, this mystery will interest you when you read it. I give a thumbs-up to this amazing, intense story hoping that you will also find yourself traveling through the exciting world of Down the Rabbit Hole. Review written by Dorothy, Grade 8. Date of review: April 2009.
Review: “Local Resident Found Murdered.” Ingrid is very worried about all this. She never wanted to get involved with it, but sometimes things could happen for a reason. Down The Rabbit Hole is a very mysterious and intriguing book. Peter Abrahams does a good job of keeping you reading and never wanting to stop. This is the first book in the Echo Falls Mysteries. Ingrid is a girl that is very brave, smart, and loves to solve mysteries. There are a lot of mysteries going on at Echo Falls and Ingrid happens to get in the middle of them. Ingrid is reading the newspaper when she sees that Kate Kovac had been murdered. Strangely enough she had been to Kate’s house just the day before. So in the middle of the night Ingrid goes to get her cleats back, and in the process she got two guys put in jail for a murder they did not commit. She decides to try and solve the mysterious murder on her own. While playing Alice in the play Alice in Wonderland, a new actor named Vincent seems suspicious to her. It turns out that Vincent has a big secret and Ingrid figures it out. It looks like Ingrid went “down the rabbit hole”. Down The Rabbit Hole was a very good book. It always made you want to keep reading because it was really exciting and intriguing. This book is a great book to read anytime. It is packed with adventure and fun. The author did such a good job describing the scenes that I could really picture them in my mind, like at the end when Ingrid and Vincent were in the river hanging on to the buoys. I really felt like I was in the book solving the mystery with the characters. Also, Ingrid (main character) used a lot of connections in the book and I thought that was really interesting. For example, she always made connections to Sherlock Holmes during the book. Most characters don’t do that in books but it really did fit her. I can’t wait to read the next book in the Echo Falls Mysteries called Behind The Curtain. This book sounds as good as Down The Rabbit Hole. Also, congratulations to Peter Abrahams for becoming a nominated novelist for the Edgar Award. Review written by Jennifer, Grade 6. Date of review: October 2009.
Review: Have you ever told a little white lie? Did it then grow so large that you’re caught lying to everyone until it all explodes in your face? So sets the stage for Down The Rabbit Hole by Peter Abrahams. After her appointment to the orthodontist, Ingrid Levin-Hill takes a ride from one of the odder residents of Echo Falls. The children even call her Cracked-Up Kate. Ingrid was told never to take rides from strangers, but in a crunch for time to get to soccer practice and thunder rumbling nearby, Ingrid agrees. After this, the events of Down the Rabbit Hole start to unfold. Later after Ingrid finds that she left her shoes at Kate’s house, she must find a way to get them back alone. The only problem is that the next day, Kate is found dead! After she sneaks into the house she finds herself tangled up in the case. As her hero, Sherlock Holmes would do, she tries Even thought she doesn’t consider herself very smart, to solve this on her own. It gets more complicated as she balances soccer, school and the lead in Alice in Wonderland. As she struggles through the mystery without aid of any adults, her friends, or the curious Police Chief and his son. She must lie, sneak and snoop to solve who murdered Katherine Kovac. This is Peter Abrahams' first children’s book, he is a popular writer of adult mysteries, and this novel follows a teen, Ingrid who tries to solve it herself instead of confiding in the adults in her life. One thing about Abrahams' novel that I enjoyed was character development, for example Ingrid becomes more brave, gains more confidence, and finds out that people are not always what they seem and that there is more to some people than what others think. I thought it was a great compelling novel, with good plot twist and at the end, the sub-plots tied together well. The plot of this book was enthralling and exciting, I couldn’t put it down. This mystery not only exceeded my expectations, but I am recommending this to any young adult looking for a great read. 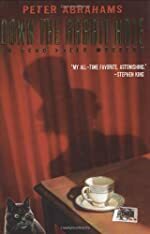 This incredible book was the 2006 winner of the Agatha Award, Best Children’s/Young Adult Fiction. There is also another book in the series that I would also like to read, Behind the Curtain. This book was the finalist for the 2007 Agatha Award, Best Children’s/Young Adult Fiction. Review written by Jonathan, Grade 6. Date of review: October 2009.
Review: Down the Rabbit Hole is a very good hard case crime, action filled, and comedy packed book. This book is just the ingredient for an evening full of suspense and fun. This superb crime novel is written by Peter Abrahams and is the first book in a wonderful series. The 13 year old female main character, Ingrid, has countless passion and talent for theater and soccer and has a great personality. As Ingrid is in the doctor’s office waiting for her mom to pick her up to go to soccer practice, she realizes that her mom is very late. She decides to run to soccer practice. She gets lost and ends up in the flats of Echo Falls. Here she meets a very strange lady whom her friends call “Cracked up Katie” but her real name is Katherine Kovac. Ingrid stays in her house until the taxi arrives. When the taxi arrives she accidently leaves her cleats at Katherine’s place. The next day Katherine ends up dead, strangled. Ingrid one day fakes that she is sick and she tries to find evidence related to who killed Katherine. The next day she needs her cleats back because her family has noticed the absence of them. In the dead of the night she sneaks out and breaks into Katherine’s house and looks for them. She finds them upstairs in a pile of evidence. She slithers under the police tape and quietly grabs the shoes from the evidence pile. When she turns to leave she hears a noise and hides under the bed. The window shatters and a man’s feet come into view. She doesn’t know who’s they are but she is keeping it in the back of her mind. Ingrid auditions for the role of Alice in Alice in Wonderland. In the end she puts the evidence together with some more that she gets from the theater but will it be enough to solve the crime! I really liked how the author put numerous suspenseful moments together to create just the right effect for the book. I also liked the different characters and the personalities that they withhold. One thing that I didn’t like is the abrupt movement of different scenes. That kind of threw me off, but only a little. The reason to read the book is because of the way that suspense, action, and comedy clash to make the perfect taste of entertainment to satisfy your needs. I would highly recommend this book to mostly pre-teens to adults. Most of the content is too mature and young children will not understand it. Overall the book was great with very little flaws and infinite memorable moments in this hard case crime. Review written by Kevin, Grade 6. Date of review: January 2009.